Never Break a File Again! Why break a file again? The safest automated endo handpiece on the market that replaces expensive Nickel Titanium rotary files. The handpiece action replicates hand file movement using vertical reciprocation and a passive ¼ turn that eliminates "Torque Stress" and file separation usually found with rotary handpieces and files. Mechanical rotary instruments create a round hole to the apex, and don't always adequately address ribbon-shaped or ovoid canals. Rather than using a rotary system that forces the canal to adapt to the instrument, Endo Pulse with the stainless steel Master Files™ adapt to the natural anatomy of the canal for safe and fast canal debridement from access to apex, even in the most calcified and curved canals. Ovoids, fins, and tapers are no problem. Plus, the Endo Pulse™ (EP) self irrigates as you file the canal without the need for separate irrigation equipment. Just use the water from your high or low speed tubing. EP Cavitates syringe administered NaOCl in canals to reduce procedure time. Cavitation has been shown to improve canal disinfection and smear layer removal. If hand irrigation is preferred, simply turn off the water flow. 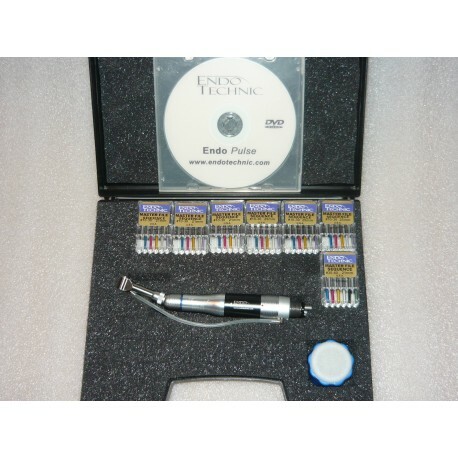 E-Type handpiece comes with 20K motor for use in both low or high speed systems. The Master File™ is a patented design to be used with the EndoPulse handpiece for vertical reciprocating canal debridement. Designed for pathfinding and enlargement of narrow calcified canals while flexing around all curves. The file body is a modified .02 taper Hedstrom design that cuts on the upstroke only without separation. Flutes cut only where desired. Patented file tip has a non-cutting bullet shape that prevents apical transportation, ledges and perforations. Non-latch handle is shorter and offers more freedom in small oral cavities. Endo Pulse™ Kit Includes: Endo Pulse™ handpiece and micro 20K rpm air E-type motor (w/irrigation port), 6 boxes of Master Files™ assorted sizes 10-30 (1 ea sz per box), 1 box Master Files™ assorted sizes 35-60 (1 ea sz) , clean stand , DVD, and written instructions. File sizes 8-60 available separately, item #s 4788-4802.